Wargames Grand Opening, Nashville Tn. Wargames had a grand opening party that was a lot of fun! There were a lot of games run, people and food. I wish Baxter and Nancy the best! Thanks for throwing such a fun party! You can watch the slide show above as is or click it to get the full effect. The slice captions are written to be both educational on my experience and humorous in various spots. In fact I probably spend more time bitching about the camera and the flash than I do about actual techniques but that is mainly because the techniques for painting the Zuzzy Mat are not much different from painting a figure. A very large 72″ tall, 48″ wide figure at that! In my attempts to paint glowing lava on Zuzzy mats you will get a chance to see how various shading techniques work. I hope you like what I’ve accomplished so far. More to come! Go to this link. And watch the new trailer for Indian Jones and the Kingdom of the Crystal Skull. Notice the frame I’ve captured above. 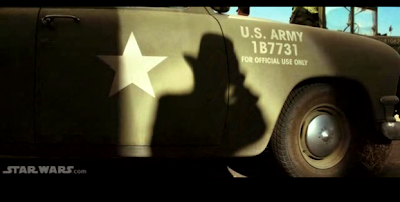 See the number on the Army Staff Car? 1B7731. If it had been 1B7331 it would have said that Indiana Jones is the Best there is. 1B = I be or I am. 7331 = 1337 in reverse, which = LEET or Elite or the best there is! However with it being 7731 it is not as obvious. Maybe there is some other hidden meaning but I was pretty excited when I saw this the first time only to realize they were off by one character from having a great hidden message! Oh and even if it was all reverse it would just be “Elite am I” so the message would remain intact. While Harrison is looking a little long in the tooth the film looks great. The others have not held up at all in the modern era – the super matting jobs they did post Star Wars, while great at the time on the big screen, have not held up on DVD or television. When Lucas redid the Star Wars films in digital he preserved their legacy. It may be a lot to ask to have the Indy films redone in a similar way but that is what it would take to rescue them. The Kingdom of the Crystal Skull comes out this Summer and I’m sure I’ll be there opening weekend. Enjoy! 1.) the vehicle is a 1949 Ford Thunderbird. The Army used civilian vehicles for staff cars in this time period. I’ve seen a lot of pictures of 1942 Ford flathead-8 Cylinder sedans but nothing from this time period. They could have used Thunderbirds. I can’t say if the vehicle is correct or not. 2.) I CAN say that the markings on the car ARE wrong. The star is on the wrong door. it should be on the back door not the front door. The phrase “For Official Use Only” probably shouldn’t be there. I can’t find another vehicle used in this manner with that on it. Finally the military vehicle number appears wrong. It should be 6 characters with the first character a letter or number and all the others as numbers from all the examples I’ve seen. So either they just didn’t bother to do any research or there are even more things to work with for any hidden message. I’m sort of losing faith there is any message here. 3.) The car, while a model that eventually transformed into the Thunderbird is actually a Fordor. In 1949 Ford was a company in need of revitalizing. Their simplified line contained the Tudor sedan, the Fordor sedan and the Coupe. Not that that means anything but if the government was going to buy staff cars they would buy the Fordor model. I have a question on the lettering on the vehicle however. I need to see other government vehicles from that time period to know if they used the correct font. Anyway – this has little impact on the fact if they did or did not hide a message here. I still haven’t heard any strong opinions one way or the other. 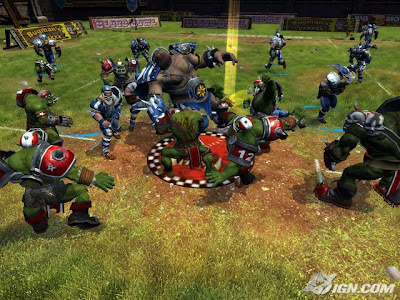 Blood Bowl Coming to the 360! Back in circa 1986 or 1987 I picked up a curious boardgame called “Blood Bowl” that took American Football and Games Workshop’s fantasy world and stomped on them until their parts mixed. It was a fun game that eventually produced a miniatures game (I never got into it that much.) It was fun. I am glad to see there is now a good looking computer version coming out! Cyanide Studios is promising it for 2008 and I can say from the screen shot it looks dead on gorgeous! More details will be forthcoming when I can find anything more on this. This is a must have for me for 2008! The initial phase of the game pitted Jeff and I against each other. My Apache’s had rifles and Jeff had a mix of shotgun, heavy pistol and repeater. I did not get out far enough to take advantage of my range and that ended up being a problem. While I took out one of Jeff’s guys, my slow reload time made me a sitting duck. He took out one of my braves, then my leader’s horse, then my leader and it wall all over. I headed for the hills. I should have made tracks for as much distance as I possibly could to take full advantage of my 24″ rifle range. Meanwhile the U.S. Infantry holed up in a 2 storey stone building while the Desperados and Cowboys made a run for them. Odds were against them holding out for long until the Cowboys and the Desperados started to shoot each other up! The Cavalry did suffer when the leader was wounded but he managed to hold out when the building was stormed. Pretty soon both the Cowboys and Desperados were eliminated and Jeff’s band of merry Outlaws rode into the scene. Soon is was 2 against two. Then one against one. Neither side head for the hills. In the ensuing gun battle Jeff finally got lucky and offed the last Infantry man. Les took some pictures so when I can get a copy I’ll post them here! I was talking on the phone with Old Glory about my recent change of address. I’m part of the Old Glory Army and as such one of my benefits is I get a new figure every month. It is a really cool benefit actually. While on the phone we got talking about their ranges and it turns out they have some new ships coming out for 25-28mm scale that will be perfect for Age of Piracy gaming. A Fourth-Rate, a merchantman and a Frigate (approx. 24″ long!) will be coming out. Price TBD but his guestimate puts them in the very affordable range. They will be solid cast from a light weight material which is fine by me – I curse every time I have to move my metal miniatures! I have a resin cast ship that is about 18″ long that I got eons ago from Wargames Ruins for about $50. It isn’t painted because it isn’t assembled. It’s in a sagan amount of pieces! One could call this the $500 miniature of my collection if I get into the period. What, you ask, is a $500 Miniature? My friend Marty picked up a miniature at a convention that he really liked. It was in a new period he didn’t have any other figures for. Well by the time he got done buying miniatures and building terrain for that one figure to participate in it had cost him $500. All for a $2.50 piece of unpainted white metal! Well that is news for today. A question that I had a while back was if AT-43 and Confrontation: The Age of Rag’Narok have the same rules. After having played a dozen games of AT-43 and a couple of games of Confrontation and having read both rules side by side I can state that both games, while superficially similar, have many differences. I’ll dedicate this article to examining those differences. In both games you need to keep track of various point totals. Both games have their own point totals that need tracking. In At-43 you track Leadership Points, Reinforcement Points and Victory Points. Leadership is used to issue combat drills (which are absent from Confrontation) and activate units that lack NCO’s or Heroes. Reinforcement points let you bring in additional troops into the battle and help you manage your reserve (both concepts are also not in Confrontation.) Finally Victory points are used to determine the winner of the scenario. Confrontation has nothing exactly equivalent to victory points. In Confrontation you have pools that you track. One pool is the Faith Pool that allows those faithful to the Gods in your ranks to invoke miracles. You track a Mana Pool that allows the magic users in your ranks to issue spells and then you have an Elixer Pool. This pool is tightly bound to the background story. Elixer represents soul fragments that your heroes are seeking to become more complete. When they have Elixer they can become more powerful. Usually a scenario is won by earning a certain level of Elixir. Story wise, Elixer is imbued in objective points that the Gods themselves want the Heroes to fight for. It is a very nice tie in I think. In AT-43 there is a simple structure based around the Authority Test and the sequence of activation. Confrontation has a very rich set of systems. Yes, you read that right – there are multiple ways the game can be played and I love the idea of it! You can play it as a choice or roll a D6 to see what the result is. Fantastic. It adds a new element to changing up the game and allowing a skillful player to really shine without adding a lot of random uncertainty (that benefits the unskilled player). AT-43 has Officers and Heroes. Confrontation has Incarnates and War Staff. Confrontation’s incarnates are directly tied to the Elixer in that they can use it which makes it different from Victory Points. The War Staff can have standards and musicians that have command and control game effects. In a way, Confrontation’s command and control is more advanced than AT-43’s which is odd given the theme of both. You would think technology would allow for better Command and Control but I guess in the Heroic world of Confrontation the will of the Gods trumps radios and heads-up displays! AT-43 has something I sooooo wish was in Confrontation: A glossary (and pseudo index – some entries refer back to page numbers for relevant rules). Confrontation makes it so hard to find things and thus makes it a lot worse as a reference while playing the game. Both sets of rules REALLY need indexes – real ones, but AT-43 definitely had the advantage here with it’s glossary. The Confrontation rules are 80 pages long while the AT-43 rules are 127 pages long. That is a greater than 50% increase from Confrontation to AT-43. An example of something in the rules that isn’t really well defined is Close Formation. It is mentioned and some rules are given but there is not obvious specific benefit from it. I don’t know why it is there. I suppose one of the armies uses Close Formation and perhaps we’ll see a rule for it. I flipped through some of the Army excerpts they have on the web and didn’t see anything about it. 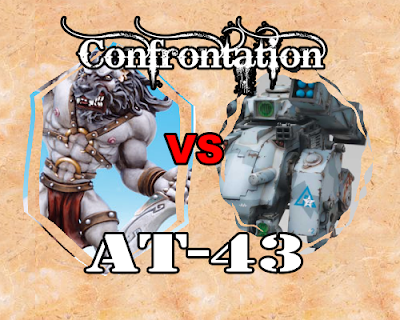 AT-43 has 4 categories of units while Confrontation has 5 categories including Titans! I’ve seen the Dirz Titan which is quite impressive but even at 25% discount (Brookhurst Hobbies) is still very expensive. I did manage to pick up a dwarf war chariot (with cannon!) at 50% off from the same source! I’ve begun assembling it last night actually. AT-43 has specialist and support weapons in infantry formations. Confrontation has specialists but they aren’t as generically defined as the ones in AT-43. Often they are unique to the formation they serve. For example the Army of the Boar’s Thermo Warriors can have with them a Thermo Priest. AT-43 defines a beaten area called the Zone of Fire for ranged attacks (the majority of the attacks in that game). Units caught in the zone will absorb hits first before the target is hit. In Confrontation the same unit causes interference and does not absorb hits but instead makes the attack 2 levels more difficult. AT-43 has the concept of infantry units being grounded, as that works with the caught in the zone rule. Confrontation has no such rule. Confrontation has a more logical rule for Area of Effect. A lot of people prefer it to the one in AT-43. I expect there will eventually be a FAQ that will change the AT-43 rule to the Confrontation method. Indirect, area of effect weapons in AT-43 are extremely accurate. With the Confrontation rule they become much less so. The rule may or may not change. AT-43 has 4 unique armies with 3 factions each. Confrontation has many armies, each with a rich background. So far I’ve only seen one platoon pattern per army. I don’t know if this will change with the final edition of the Army books. I am curious to see how they will eventually turn out. The examples given on the Confrontation.fr web page show the amazing depth that Confrontation inherits from the 3 prior skirmish versions of the game. Overall I would say that Confrontation is the more complex and deep game with a richer set of rules for game play, magic and miracles and army design. However AT-43’s theme and simpler game play means it will also appeal to many people. I think some will be surprised to see the differences between each game – having previously assumed that the two games were exactly the same with just a thin theme veneer separating them. This is definitely not the case. I like both games quite a bit. No matter what game you choose I think you will find the tactical choices they present and the interesting back story will keep you well entertained. Earnie Pyle was a famous journalist that covered WWII in the Pacific. He was greatly loved by the soldiers and took many risks. In April of 1945 he was close enough to the front line to get killed by a bullet from a Japanese machine gun. It turns out that someone took a photo of his body. I read that the photo wasn’t very graphic or grisly and that Mr. Pyle appeared to be at rest. I would copy the article here into the blog but there are many copies of it out there in both the media (AP carried the news) and the Blogosphere so I’ll dispense with that. At 3PM on Memorial Day in 2008 I’ll be sure to keep Mr. Pyle in my thoughts.